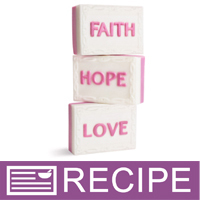 Spread awareness for breast cancer with these pink and white inspirational soaps. Hope, Faith and Love - what an encouraging and inspiring combination! This fragrance-free project offers a creamy lather soap suitable for sensitive skin types. The pink color and inspirational words make this soap suitable for breast cancer fundraisers and breast cancer awareness. This project is a soothing distraction from a cluttered mind! You Save $10.50 by purchasing this kit rather than buying the items separately.